This aluminum VHD-2004 Photo/Video Tripod with VH-10 Fluid Ball Head from Sirui consists of four-section padded legs, a rotating ball head, and a fluid head that together weigh 5.5 lb. The legs tighten with twist locks that adjust with a simple turn to extend the legs to a maximum height of 68.9". A second, short center column is included which allows you to drop the tripod to a minimum height of 9.1" without having to lift the column up. One of the tripod legs disconnects and can be used as a monopod, if desired. A bubble level on the top of the legs helps with balance. 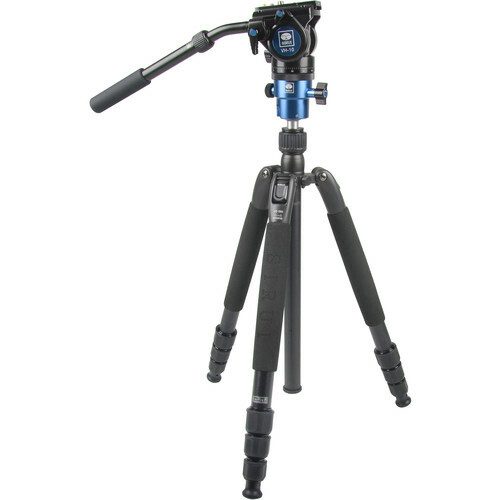 The rubber feet are removable and can be swapped out for optional spikes, and the tripod also features a 1/4"-20 accessory mount. The ball head is installed on top of the tripod and supports compact DSLR or midsize cameras weighing up to 33.1 lb. A separate pan lock disengages and allows the head to rotate 360°. The ball also moves freely after unlocking the head's lever lock, and at the same time the cut notch on the side of the head permits you to position a camera at a set angle. The VH-10 fluid head connects to the ball head and features two bubble levels and a telescoping pan handle. A quick release plate with 1/4"-20 and 3/8"-16 threaded mounting screws is included with the head. Load capacity of 33.1 lb, 5.5 lb weight, maximum height of 68.9", and minimum height of 9.1"
Box Dimensions (LxWxH) 29.6 x 6.4 x 5.8"